Welcome to Worldbuilders, a series of guest posts and interviews by my fellow authors of Christian speculative fiction. 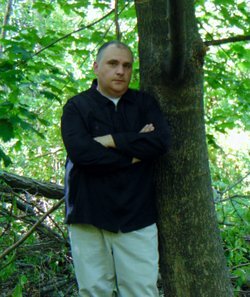 Today’s interview is with John J. Zelenski, author of The Journal of Ezekiel Walker and Walker’s Vale. Next week, we will chat with Keith Robinson, author of the Origins Trilogy and the Tartarus Chronicles. Now let’s talk to John! John: Definitely tea, but iced and sweet please. Tony: That entire answer makes me suspect you’re a bit more Southern at heart than Pennsylvania. What do you think prepared you or qualifies you to write in your chosen genre? John: I tend to write in the supernatural / paranormal genre of speculative fiction. Growing up, our family purchased a home where strange and unexplainable events began to occur. After our minister came and prayed over and throughout the house, the bizarre occurrences ceased. Having been witness to some of these events, I naturally wanted to connect with readers, from Christian point of view, what I believe these manifestations really are. Tony: 67yTell us about your writing process. Do you write with a pen, typewriter or computer? Do you listen to music? How often do you write? John: I use the computer for sure. Easier to backspace than to erase I say! I prefer a nice, quiet environment where I can read aloud my sentences to see if they move me or not. I write whenever I have a spare moment, which is sometimes difficult to find. John: I suppose my ultimate goal is twofold. To entertain the reader while also deliver an underlying message of hope and redemption through God’s love. Could it be that I’m a preacher in disguise? Perhaps, but if the story itself is not interesting or doesn’t keep the reader motivated to want to finish to the very end, the message is not going anywhere. John: My newest book is titled, The Journal of Ezekiel Walker, which is actually a prequel to my debut, Walker’s Vale. It gives a background and history of the strange, country town of Walker’s Vale, Pennsylvania. It also focuses on a young Ezekiel Walker who is thrust into the battle between the forces of good and evil. Let’s say Mr. Walker has an opportunity to look the devil straight in the eye! John: The character I can relate most to is James Cooper in Walker’s Vale. He is the main protagonist in my story and is very complex. At heart, he’s the kind of guy you’d like to have as a best friend. Sincere, loyal, and motivated to do the right thing. At times, however, he makes stupid decisions based on feelings and the momentary. He’s troubled in the sense that he knows the truth, but he needs hard proof to justify his reasons for believing. Tends to blame himself a lot too for things that he has no control over. John: I have two currently with lots more on the way. Walker’s Vale and The Journal of Ezekiel Walker are my two literary kids. I am also very proud to say that my story, The Attic, is included in the newest Crossover Alliance Anthology, Volume Two. John: My next project might be involvement in the production phase of Walker’s Vale, the film. Right now it is churning its way through the pre-production phase. I have teamed with Allegentsia Productions in Hollywood CA and the extremely talented team of Jon and Sharelle Hall. The script has been written by the masterful Paul A. Rose Jr. so good things are on the way. Tony: That sounds very exciting! Where can we buy you books? How can fans connect with you? John: My books are available online from most major retailers and of course the smaller guys too. However, if readers want an up close and personal experience, they can purchase signed copies directly from me via my website, www.johnjzelenski.com. Thank you Tony for having me!